Like a lot of vegetarian cooks, my pantry shelves are full to bursting with an enormous range of ingredients and, at this stage in my life, I want to bring it all in and consolidate my pantry staples into some kind of semblance of order and usability. When I read a recipe which includes yet another ‘must have’ esoteric ingredient, my eyes kind of glaze over because I know unless I’m absolutely compelled to cook something and use that ingredient more than once, I really shouldn’t be buying it. 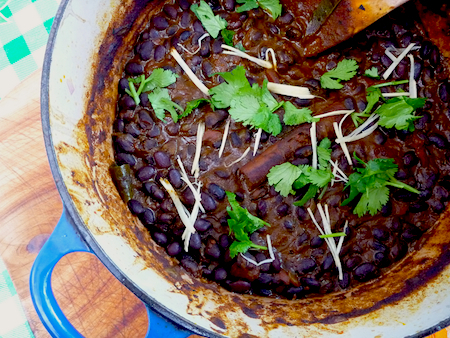 So that is why I decided to use black beans instead of the whole urid black dahl to make this dish. 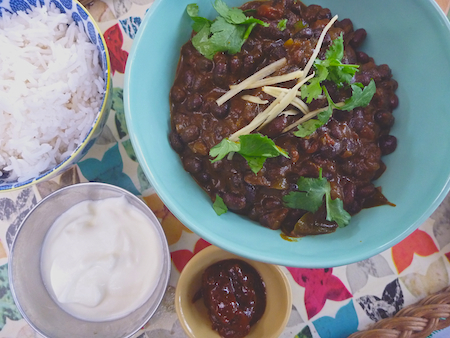 Urid dahl has a distinctive sticky, viscosity that the black bean lacks but there are enough similarities that make the black bean very sympathetic to cooking them in this Indian style dahl. 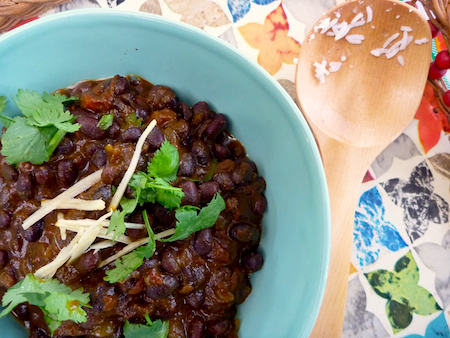 Really, it’s all about consolidating my pantry staples – while I can find endless uses for black beans, the poor old urid dahl seems to be less versatile. 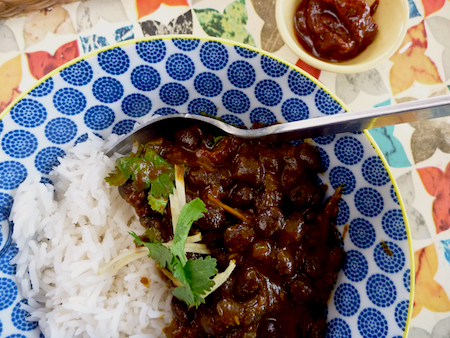 I’ve adapted this recipe from Rick Stein’s black dahl in his most recent book, India: Recipes from my Indian Odyssey. I’ve had this book out from my local library for about a week now, and I’ve been reveling in it’s lavishly photographed pictures of the gorgeous Indian food, street scenes and landscapes. It hasn’t got a huge vegetarian section but I’m enjoying Stein’s take on classic Indian vegetarian dishes, with his particular kind of panache and flair. The recipes aren’t rigidly authentic and have been adapted to suit British tastes but it has been done with such exuberance and love that I find myself wanting to try every vegetarian recipe in this book. In keeping with this process of food adaptation to local tastes and circumstances, I’ve used black beans, replaced Stein’s use of Kashmiri chilli powder with sweet paprika and chilli powder (that’s all about more pantry/spice consolidation) and thrown in some curry leaves – that’s because I live in Sydney and I have a curry leaf tree in a pot in my front yard and I like to use them for a bit of that local flavour. The spices in this dahl, along with the knob of butter thrown in at the end, make this a rich and warming dahl, which is perfect for Sydney at the moment, which after the hottest spring on record, has lapsed into chilly and gloomy raininess. It’s just the thing to warm you up after the recent drenching we’ve experienced. Wash beans in cold water, cover with fresh water about 4 cm over beans. Leave to soak overnight. Drain soaked beans, place in pan and cover with water about 2 cm over beans. Bring water to boil, turn down to simmer, partially cover pan and simmer gently until tender for about 1 to 1½ hours (if using urid dahl, this will probably take longer). Top up beans with a little water as needed. As the beans are cooking, heat three tablespoons of oil in a frying pan, and fry cinnamon stick for about one minute until fragrant, throw in curry leaves until they sizzle, then add onion and cook until golden (about 10 minutes). Stir in asafoetida, tumeric, coriander, sweet paprika and chilli powder, and saute until fragrant. Add tomatoes and juice, ground roasted cumin powder and Garam marsala and cook down for about ten minutes until this is reduced and thickened. Add tomato mix to black beans and bean liquid (if you are using canned beans, add beans and liquid to pan). Simmer for about 30 minutes uncovered until the sauce thickens and the flavors meld. To finish – stir in ghee or butter and garnish with finely shredded ginger and chopped coriander. Serve with rice or flat breads, yoghurt and pickle. This is another excellent dahl. Mmmmm. I will highly recommend this dish to anyone who asks me about it. Yes I have Rick Stein’s book and was going to cook the black dahl using black beans as well, as I cannot find urid locally. What a coincidence to find your recipe. I just know it’s going to be delicious .. not sure if as nice as the one made by Mother India in Glasgow, but I’m going for it! Black dahl is one of my favourite vegetarian dishes, and it’s obviously highly regarded by Rick himself. Very nutritious too. If the whole world became familiar with the delights of this dish, there would be far few animals slaughtered for food. Dahl is an essential basic of the vegetarian diet as far as I’m concerned. We should all be eating more of it. Great recipe! I made a version of it last night and my family gobbled it up 😎 Will be on our dhal rotation for sure now. Thanks!